Consider the device juggler – emailing with a PC, next a smartphone, and then with a tablet or different PC. Do they seem more talented or rare than most of us? Our research shows they are not that unique. Ninety-six percent of those with 2 or more connected devices do at least one type of personal activity across multiple devices. However, the range of multi-platform activities is so broad and unique to the individual user that no single type of activity is cross-platform for the majority. This defines demand for smoother user experiences. Based on the 2018 wave of the TUP/Technology User Profile survey, we find that 89% of online adults with 3 or more devices do at least one personal activities across 3 or more of their devices, and 83% of 4+ device users also do. However, none of the type of activities are being used by more than one-sixth (17%) of those with 4 or more devices. And, the top multi-platform activity across multiple countries is obtaining free apps. The top five multi-platform activities for those using 4 or more devices are similar in or more devices. Multi-device users in China and India have the highest level of multi-platform activities, with several exceeding 10% of 4+ device users doing the activity across their 4 or more devices. These involve free apps, social media, and music or email. For multi-device Americans, multi-device game playing ranks highest. 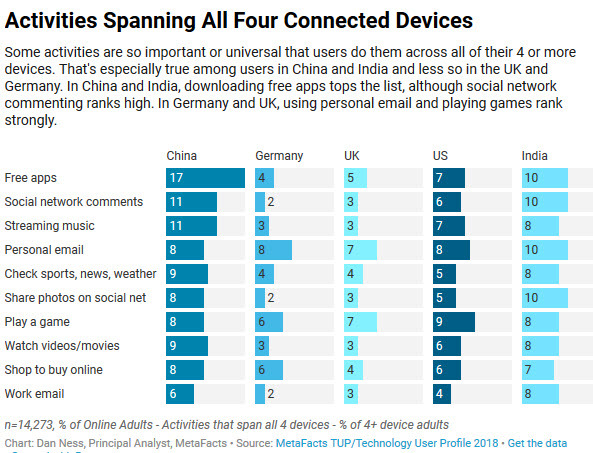 In the UK and Germany, multi-platform personal email ranks highest, although in these countries the multi-device rate is lower than in the US, India, or China. Technology users have proven that they can and will juggle multiple devices. Currently, the market is spotty, and for multiple reasons. Most multi-device users have devices which use different operating systems. This not only limits which apps are available or identical across platforms, but also means the user’s experience often requires adjustment or learning on their part. Users continue to experiment with using more and then fewer devices. Most haven’t found a single device for all they do, and they aren’t likely to anytime soon. Furthermore, with experience, users discover more ways to use what they have and further integrate device use into their everyday lives. This underscores the growing demand and market readiness for a smoother, more integrated multi-device experience.